Extension ladders come with feet that pivot so that they can bear fully against a hard surface, as shown in the drawing. 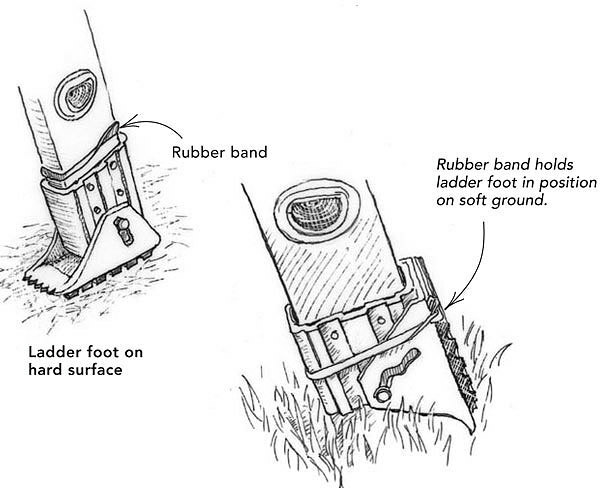 When using the ladder on soft ground, the feet can be rotated to a vertical position so that the serrated edges bite into the ground. This is a handy feature, but I’ve found that whenever I move the ladder from place to place on soft ground, the feet want to pivot back to a horizontal position. With 20 ft. of ladder hovering overhead, this is not the time to be standing on one leg trying to coax the ladder feet into vertical with my other leg. To prevent this problem from occurring, I’ve wrapped a sturdy rubber band around the bottom of each ladder leg. As shown in the drawing, the band holds the foot in a vertical position even when I move the ladder. I understand that you're going to tilt those feet in the manner in which the ladder was designed, but I think that I would have designed the ladder differently. I believe that the serrated edges should be on the other side of the feet, such that serrated edges, when down, would be between the ladder and the wall. As the ladder tries to slide away from the wall the serrated feet would dig into the ground with the upper edge of the feet levered against the ladder. With this design change there would be no chance of the feet tipping over onto their rubber face and sliding like I fear could happen with the exiting design. Join us in Nevada City, CA, on March 21 for a presentation about and a guided tour of this modern energy-efficient home. Learn how to nail the details to build a beautiful and functional covered porch; 3 case studies and a checklist of essential questions will help you get the job done right. This Texas house borrows from the ground and the sky to achieve net-zero energy use and complete water independence. Podcast Episode 167: How Detailed Should a Remodeling Estimate Be?